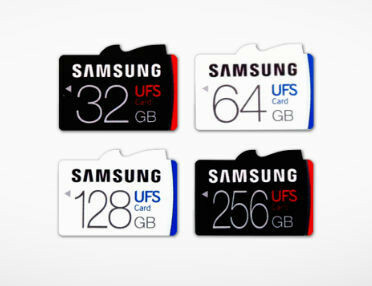 UFS (Universal Flash Storage) chips are now commonly found in premium smartphones, but the UFS standard has also been published for removable cards, and Samsung has just introduced their first cards based on UFS 1.0 Card Extension Standard* for use in high-resolution mobile shooting devices such as DSLRs, 3D VR cameras, action cams and drones, as a new alternative to micro SD cards. Samsung UFS removable memory cards come in 32, 64, 128, 256 GB capacity, and the latter is said to deliver up to 530 MB/s sequential read speed, 5x times faster than typical micro SD cards, and similar to what you’d get with an SSD, as well as a random read rate of 40,000 IOPS, or about 20 times faster than a typical micro SD card. Writing performance is not too shabby either with 35,000 random IOPS, two levels of magnitude faster than typical micro SD cards achieving a few hundred IOPS, and up to 170MB/s sequential write speed. This could potentially become an excellent boot device for new development boards eventually, once/if the standard adds support for boot capability, and boards get UFS card support. Samsung has not released any pricing info so far, but those cards are likely to be a little pricey, least at the beginning, considering they match the performance of some SSDs. This would be great for development boards!, sd’s are a pain in the ***, they just aren’t relaible. In europe one can buy a 120MB (slow) SSD by 30€ or less. I just bought a new and rather fast Intel 535 120GB (Read 540MB/s/, Write 480MB/s) for 39 Euro incl. shipping. 170MB/s sequential write speed is good but I am more interesting how is the random 4k read/write, especially on 32/64GB cards. In March 2016, the SD Association announced a new standard for memory cards that will support 360-degree, 3D, and 8K video. The new version 5.0 SD cards will feature minimum sequential write speeds of 60 MB/s and 90 MB/s, designated by the V60 and V90 video-speed-class labels, respectively. The cards will write to memory blocks as large as 512 MB, which contributes to the speed boost. Exactly when the new cards and compatible devices will hit the market is unclear, but we’ll test some for an upgrade pick when they’re commonly available. The Sdcards people use are actually from the camera and video world, so designed with them in mind and not single board computer.